Hawk Miniatures are also please to announce that we will be attending the Welling model show on the 5th April more details to follow. Our new figure of the month is Captain John Blakiston of the Royal Engineers who was on of Arthur Wellesley main advisor during the Indian and Peninsular campaigns. This is a 75mm figure which has been sculpted by Alan Ball and the bx art has been painted by Eddy Vandersteen. This is the second figure in the Battle of Asssaye set which Hawk Miniatures will be releasing. See below for the third figure. 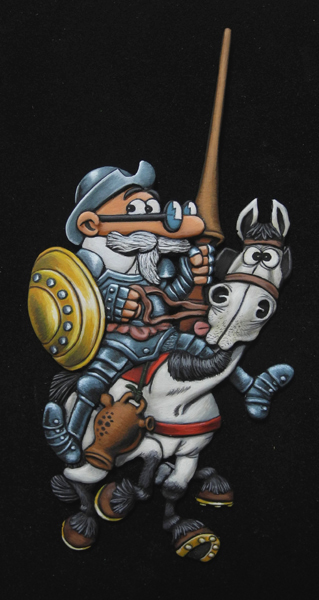 Rafa Cebrian recently released two new flats in is range one of Captain Tercios Dalmau - Officer of the Thirds (shop page ) and the other one is a new Mortadelo caricature of Don Quixote (shop page ). The third figure in the Battle of Assaye series will be released at some point in March, but here is a preview picture. The next figure is of Lieutenant Colonel Patrick Maxwell, this figure has also been sculpted by Alan Ball and painted by Eddy Vandersteen. The last figure will be released in April with the whole set available at the BMSS show.